Many people involved with Canine Partners for Life tell us that they first learned about CPL through a friend or family member who also participates in some way. They are donors and volunteers, know someone who volunteers or is a graduate, or are graduates themselves. That was how Janie Cramer first learned about CPL. She had a friend, Paula Brenn, whose daughter, Reina, was a volunteer dog walker during the summer. Paula shared her CPL story with her one day, about 11 years ago, and Janie was hooked! After contacting CPL, Janie thought this place would be a great match for her family at a point in her life when she felt she could be doing more to help others. About 20 years ago, Janie suffered a back injury that caused spinal stenosis, which results in constant back and leg pain. 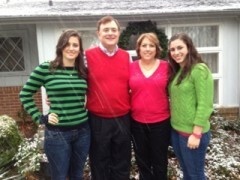 All she wanted out of life was to continue to be involved in her daughters’ lives through their high school years. Fortunately, she says, “I have been so blessed to be able to continue to be a big part of their lives in college and now graduate school.” In addition, Janie’s husband, Jeff, suffered a massive heart attack in 2005, and survived. Relieved, Janie felt her family was so blessed and they needed to find a way to make others’ lives better. They found a way to accomplish this at CPL. Being a Registered Nurse and family doctor for many years, working with disabled children, and being a family of dog lovers, the Cramer family fit right in at CPL. Janie and her daughter, Steffi, started out as dog walkers and bathers, but she quickly involved her husband and other daughter, Katie, by volunteering to be a temporary puppy home for dogs who needed a break from kennel life. The family began hosting dogs seven days a week, which prepared them to raise their first CPL puppy, Dutchess. Janie’s daughters brought Dutchess to school events, involving the whole community in their puppy raising. Unfortunately, Dutchess was released from the program due to medical issues, but the Cramers are still providing a loving home for her. One of those meaningful stories is about a five-year-old girl and her home companion dog, Violet. Janie feels this experience best demonstrates CPL’s mission and reaffirms why she chose to join the CPL family. 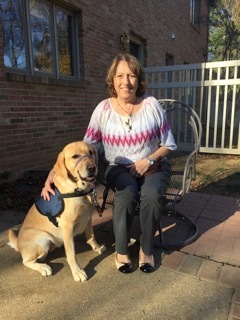 Despite raising nine CPL puppies, being a devoted volunteer, a loyal donor, and an active leader of the Board, Janie still feels as if CPL has given her more than she has given us.